Maximilian Kolbe died in Auschwitz Concentration Camp on 14 August 1941. He died horribly after volunteering to take the place of another prisoner selected for death by dehydration and starvation. You can read a brief version of that story in 'Man in Striped Pajamas'. 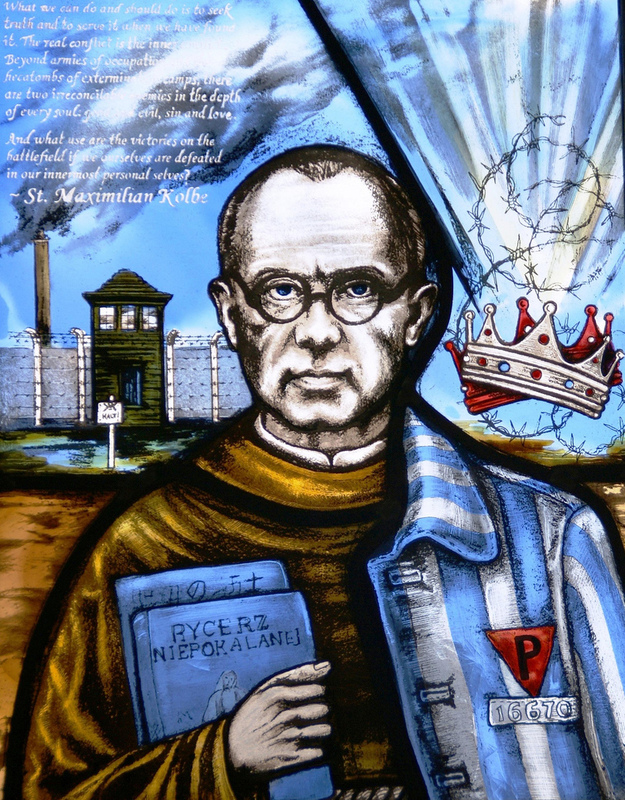 During World War II as a Polish Franciscan Friar, Maximilian Kolbe sheltered refugees from Greater Poland, including 2000 Jewish people in his friary at Niepokalanów. Using amateur radio he also actively spoke against Nazi activities. Such actions led to his arrest, imprisonment and death. He was canonized by Pope John Paul II in 1983 as a 'martyr of charity'. At the ceremony in Rome, perhaps the most significant person present was Franciszek Gajowniczek. He was the prisoner whose place Maximilian took in offering his own life in exchange. That man survived Auschwitz and lived until 1995, aged 93. "...Kolbe decided to build the monastery on a mountain side that, according to Shinto beliefs, was not the side best suited to be in tune with nature. When the atomic bomb was dropped on Nagasaki, Kolbe’s monastery was saved because the blast of the bomb hit the other side of the mountain, which took the main force of the blast. Had Kolbe built the monastery on the preferred side of mountain as he was advised, his work and all of his fellow monks would have been destroyed..."
The Church of England commemorates Maximilian Kolbe as Friar and Martyr today. Since 1998 there is a statue of Maximilian Kolbe among several above the west door of Westminster Abbey, London, UK. "If you don't recognise the humanity, the diverse image of God if you think that way, in people not like you - that's when you think driving cars into crowds, driving needles into priests' arms, is a reasonable way to behave. It doesn't start with murdering priests, Jews and gypsies. It starts with that suspicion that somebody is less than you - that that somebody wants your power - and that you'll support somebody who'll do something about that." Do go there and read the whole post and take heart - it does end on a positive note.